Dickens, Charles Dickens, the names rings in ones ear. It’s the familiarity of it, as though one has the name carved into the mind, it musters up a sense of knowing, something one can’t quite pinpoint- maybe a feeling that belongs to a long lost uncle. Even if you have not read Dickens, it’s terribly likely you will do at some point in your life, most certainly if you plan to study English Literature. People recite Oliver Twist, “Please, sir, I want some more” because they’ve seen a thousand adaptations of Oliver Twist on the TV. This Christmas was riddled with Dickens, first with Tomalin’s biography successfully received, then a host of programs; a new adaptation of Great Expectations and a documentary depicting Dickens’s life and how his wife Catherine suffered profusely. Expressions such as “What the Dickens! ?” and the term “Dickensian” infiltrate the air, Joyce Carol Oates once wrote in an article “It’s impossible to think of Charles Dickens and not to think of Dickens’ London…” Charles Dickens is without a doubt, an institution, but it is these very aspects, this familiarity of Dickens’s Londonand characters’, which hold one back from knowing who Charles Dickens really was. Tomalin depicts a man who as a child desired education more than anything else, but sent to work in a blacking factory; he could not fathom how or why his parent would want to do such a thing to him, whilst his younger sister was able to pursue an education in music. He would never forgive his parents for this injustice. As a child and through most of his life, he had to visit his father in prison for his numerous debts, a scene that Dickens could never banish from his mind, one that he would never wish upon a child. Throughout his success he had to bail his father out by paying for his debts, even to the point of sending his parents to the countryside to keep his father out of trouble. Then there were his lazy sons who didn’t seem to want to study or work, and the many unwanted children Catherine kept giving birth to; he favoured daughters over sons, this was evident. Dickens was a man who had to be in control, financially and otherwise over the people in his life. His marriage was ill matched, so much so that Dickens seemed to stifle his poor wife to the point that she didn’t appear to develop a character. 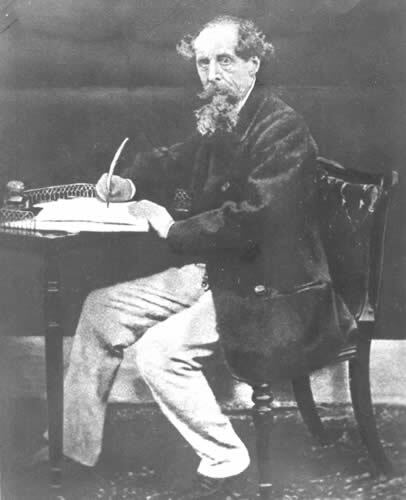 Dickens was a prolific writer; whether it was a novel or a play, he was always in motion, eager to perform for his fans and bring his work to life; he enjoyed nothing more than being the centre of attention and parading about on of the stage. The very concept of a writer being paid for public readings was conceived by him, and what a success he was. He would have been proud of Tomalin’s biography; from the beautiful cover with his name embossed in gold to the sincerity of Tomalin’s words. She portrays a workaholic struggling to keep everyone in line; a bad husband with a heart for the downtrodden and poor, helping out orphaned children whilst detesting his own. His life was far from black or white, or even grey, it was pixilated, undecipherable and without a solid form. He was stern and capable of holding a grudge and shutting his family out completely when not complied with. He was a man, who no matter how ill, wanted to give his fans what they wanted to the point of collapsing on stage. Tomalin’s biography accomplishes everything that it should, it reveals a man. It reveals Charles Dickens.